The Ukrainian sensation has never faced two-time world champion and Olympic bronze medallist Kondo Ami (JPN). Former world champion Tonaki Funa (JPN) has been pushed forward by the Japanese team but lost all three of their meetings in 2018. Bilodid, who has beaten all five Japanese judoka who she’s opposed in her young career, will likely meet Kondo for the first time in 2019. Kondo is expected to play a larger role for her country on the IJF tour this year after only two outings in 2018 while world number one and red backpatch owner Bilodid determined to stay out in front ahead of her nearest rivals and will have another active programme this year. Last year we saw an excellent World Junior Championships final between Bilodid and Sana Yoshida, also a promising youngster from Japan that might make the jump to the elite of World Judo this year and mingle in the Olympic Qualification for Japan. It was Bilodid's last contest of 2018. Kondo and Bilodid have never met in a match but Bilodid is still undefeated against any Japanese opponent. Kondo lost her final against Distria Krasniqi in the World Masters in Guangzhou. Daria Bilodid of the Ukraine became 2018 World Champion in Baku as youngest ever gold medallist. Bilodid became European Senior Champion in 2017 in Warsaw. At the age of 16 she was the second youngest female ever. Bilodid became World Cadet Champion in Sarajevo in 2015 and won the 2018 Junior world title in Nassau. She is the only judoka to take both the Cadet, Junior and Senior European title in one year. Daughter of double European Champion Gennady Bilodid. In 2018 she remained undefeated. Judoka from Japan Abe Uta became World Champion in 2018 at the same day as her brother Hifumi Abe. She was already Junior World Champion in 2017. She won the Grand Slam of Paris in 2018. Abe took gold at the Grand Slam in Tokyo in in 2017 and silver in 2016 as youngest medallist of the World Tour in 2016. She took gold in Osaka in 2018. 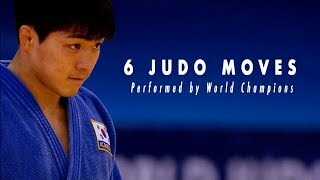 In 2017 Abe won the Grand Prix Düsseldorf 2017 as youngest ever winner of a IJF World Tour event. Uta won the World Junior Mixed Team Championships in 2017.